Few people can claim to have caught the self build bug at the age of 16, but that’s exactly what happened to Sharron Reetham. Sharron found the journey so fascinating that she decided there and then to create her own home one day. Sharron and her husband David had already built two Potton houses, which they sold on a commercial basis back in 2008. So in 2014, when they decided to create their own home near Lincoln, the couple naturally looked at the firm’s offering again. “We sent the drawings out to several other companies but kept coming back to Potton, and eventually went with them,” says Sharron. The pair already had a clear idea of how they wanted the house to look. They were keen to establish a barn-style abode that would fit with the farm building aesthetic prevalent in the local area. “We had previously hunted high and low but couldn’t find what we were looking for on the open market, especially as we wanted an eco-friendly property with energy-saving features,” says Sharron. The next step for the Reethams was to create a detailed brief for John Roberts, their architect. “We wanted this to be our forever house, with spaces we could easily adapt to our changing lifestyle as our two young daughters grew up,” says Sharron. The couple also wanted space to work from home, and plenty of room for entertaining family and friends. Energy-efficiency was a high priority, too, so that the house would be cheap to run. Sharron and David were lucky enough to already own the plot that they wanted to build on – a 1.5 acre field next to the farm belonging to Sharron’s parents. “My mother and father had given us the land some time ago. As there were other houses nearby, we thought we had a good chance of getting planning permission,” says Sharron. As it happened, the process was fraught with problems, and it took a full year to gain consent. Luckily, the couple’s architect was well acquainted with the pitfalls of local planning procedure. John advised the Reethams to appeal to the planning committee and find a local councillor to endorse their application. “We wanted to be close to my parents in their old age, and also so we could help diversify the farm,” she adds. Fortunately, the appeal went in the couple’s favour and their submission was approved in April 2015. Sharron and David financed the build using equity from the sale of their previous home and raised a mortgage for the balance. “Our initial budget was £520,000 and we ended up spending slightly more,” says Sharron. The building plot was clay, which is subject to the risk of heave. Therefore, insurance was a top priority for the project. “We had cover for £5,000,000 and it protected us on site and throughout the build,” says Sharron, who decided to project manage the scheme herself. The construction details, such as style of windows and timber finishes, were finalised with Potton by July 2015, and work on the foundations began the following month. Despite the difficult heavy clay soil, the groundworks phase was fairly straightforward. “We had plans from a structural engineer that showed how deep to go at each point, taking into account existing trees, the heavy clay soil and the tree planting scheme that had been approved in our planning permission,” says Sharron. Although the cost of this phase was relatively high, ground preparation was minimal, and the beam and block foundations they’d chosen were quick to install, which saved on building time and labour. Sharron and David decided that the most cost-effective way to manage the project was to tender the construction work out in packages, using different contractors for each stage of the development. “We used one company for the foundations, and others for the brickwork, roofing, drainage, plaster boarding and plaster work – but to be honest, our experience with builders wasn’t great,” says Sharron. The Reethams also encountered administrative problems with their chosen contractors. “Several firms we used didn’t invoice properly or seem to know the rules on VAT and self build,” says Sharron. The timber frame was delivered by Potton in mid-September. For Sharron, seeing the erection of the structure was one of the project’s biggest highlights. To line the inner walls, the couple opted for Gyproc Habito, a damage-resistant plasterboard that supports weights of up to 15kg with a single wood screw. Happily, the project progressed smoothly through the winter months, with no major delays resulting from bad weather. Sharron and David devoted a great deal of effort to putting together the interior details of the scheme. “We’d learned from experience that you need to make most of the design decisions before the build starts,” says Sharron, who planned her kitchen, pantry and utility configurations in advance. The floor plan comprises a dining hall, kitchen, pantry, den, utility, study, lounge, two downstairs WCs, plant room and garage. Upstairs there are four bedrooms, three with ensuites and dressing rooms, and a fourth with an ensuite. A fifth bedroom above the garage is currently used as a playroom. One of Sharron and David’s goals was to ensure their home was as energy efficient as possible. They installed a NIBE ground source heat pump, laying a huge network of collector pipework at the back of the house to extract warmth from the earth. Solar panels power the hot water supply. All the lighting is LED and appliances throughout the dwelling are A-rated. Another high priority was to establish a high-tech home on a budget. “We live in a rural location, so it’s important to have a good entertainment system,” says David. The couple also wanted an internet hub in each study and high-speed access in all the bedrooms. CAT6 cable was laid from the study to every TV point in the house, with extra connections at desks in bedrooms. The wiring terminates at a single outlet in the study, which is connected to a router and the broadband hub. The couple are able to store all their multimedia on a small server and stream a wide choice of films around the house. In the den, there’s a large drop-down screen and a ceiling-mounted projector, so the room can be converted into a fully-fledged home cinema at a moment’s notice. Sharron and David are very pleased with the overall design of the house and how well it works with their family’s lifestyle. 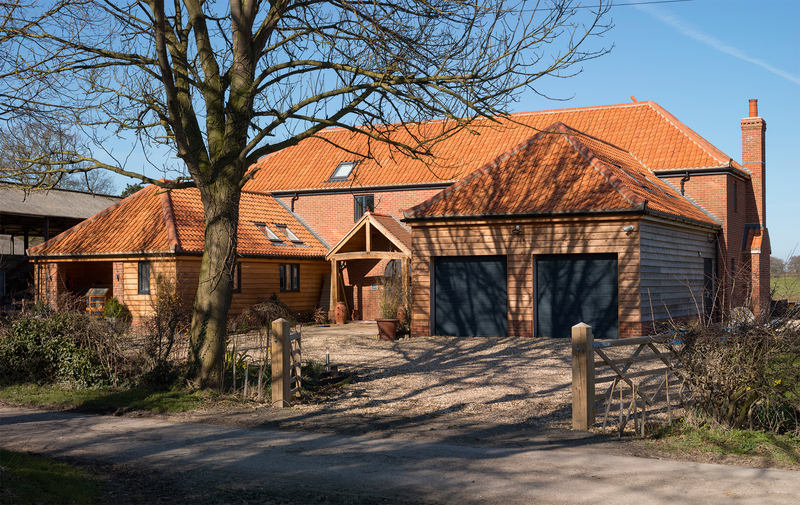 “The great thing about the self build process is that you end up with exactly what you want out of a home – it is truly bespoke. We really love the place and so do our children, and we all feel we had an input into its design,” says Sharron, whose oldest daughter was fascinated by the whole process. For Sharron, the best part of the scheme was the day in July 2016 when the family moved in. “Our first meal here was beans on toast, surrounded by boxes and furniture from storage. It was chaos, but wonderful!” she says.